Modular Muscle Design 2014 Mustang at SEMA 2013! 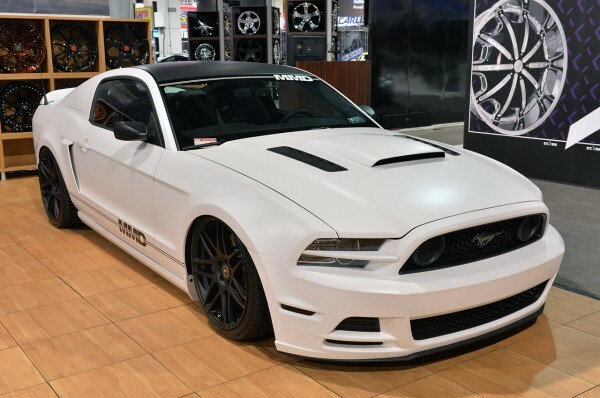 The guys from AmericanMuscle.com built this one of a kind 2014 Mustang GT to show their Modular Muscle Design parts on the SEMA show. Since this project was completed, it made its first appearance in the Forgestar booth in Las Vegas. 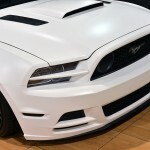 This 2014 beast, according to the catalog, includes satellite antenna cover, GT350-style window covers, a Vortech supercharger system with JLT intake, side scoops, an Air Lift suspension, Forgestar F14 20-inch wheels, Boss-style fog light deletes, retro mirrors, duck-tail spoiler, Nitti Invo tires, a Ford Racing h-pipe, headlight splitters and many more amazing details. To see what we are blabbing about check out the video and see the pictures below. At last, check out one of the best monster drifts on this link!